BWCF Board Member Frank Gilbert rides his bike to work four days a week. 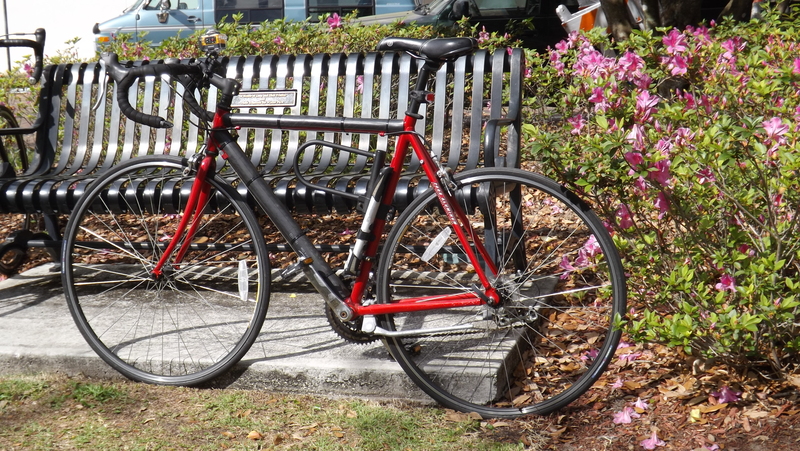 The article below from WLRN discusses cyclist safety as more people begin biking to work. Click here to listen to their radio interview and to hear reporter Abe Aboraya narrate his ride through Orlando streets. That is not what Gilbert looks like. Gilbert is middle aged, wearing khaki pants, a blue blazer and tie while cruising in his recumbent bike four miles to Downtown Orlando. The trip takes him through residential streets and across busy highways four days a week. “A part of my approach is to assume I’m invisible,” Gilbert says while riding to work one recent morning. Gilbert is one of the estimated 1,300 people in Central Florida who use a bicycle as their main way to get to work. It’s such a small sliver of the commute, Gilbert has to constantly worry about people not seeing him in the road. I see his invisibility watching a line of cars make a right turn to get to a parking garage without yielding, one after the other. “If I went out there, I would have to depend on them seeing and recognizing me,” Gilbert said. Winter Park is trying something new: Today they’re asking residents to bike to work. The city is latching on to a growing trend across the county of choosing a bike over a car to get around. But Florida spent decades building roads designed to move commuters from homes in sprawling suburbs as fast as possible. Conventional wisdom says these roads were built for speed, and federal data show Florida has the highest death rates per capita for both cyclists and pedestrians. “That’s unfortunately true,” said Joan Carter, the traffic safety specialist for the Florida Department of Transportation. The state hired her to make the roads safer for pedestrians and cyclists. One example: the DOT passed a complete streets policy in October, which requires planners to include pedestrians and cyclists when designing roads. But now they have to accommodate this growing number of cyclists. Now this may seem counter-intuitive, but what Florida needs is more cyclists and more pedestrians. The idea is that, with critical mass, more drivers will see them, says Stefanie Feskin, deputy director of the National Complete Streets Coalition at Smart Growth America. And events like bike to work day can help. And some cities in Florida are taking matters into their own hands. Casselberry, Matiland and Winter Park brought in Bill Nesper to show them how to make their cities more bike friendly. Nesper is with the League of American Bicyclists and Orlando hopes he’ll improve their rating. SunRail is a piece of the puzzle. During a recent morning commute, Nesper rolled his bike onto a pretty crowded train car. Meanwhile, Frank Gilbert wraps up his 20-minute bike ride to work as a school system administrator. To him, the risk of being hit is worth the saving of not owning a second car. We pull into the garage at his work. The bike rack is right up front. “I think you experienced it wasn’t a honk honk, beep beep kinda trip,” Gilbert says to me.